Focus and recompose is an extremely common method for getting around AF sensors with limited AF point spread, but it's an imperfect technique that could be causing you more issues than it's worth. A common complaint (particularly with DSLRs as opposed to mirrorless cameras) is that poor AF spread point across the frame makes it difficult to create off-center compositions. This frequently becomes an issue in portraits, where images that do not place the subject dead center are often desired. It's particularly compounded by the fact that portrait photographers often use medium-length telephoto lenses at short subject distances with wide apertures, meaning very narrow depth of field. Here's why that's a problem. Remember trigonometry? SOH-CAH-TOA? It's back. Sorry, but we're about to get triggy with it. Let's say I have a right triangle, and I label the bottom angle theta. 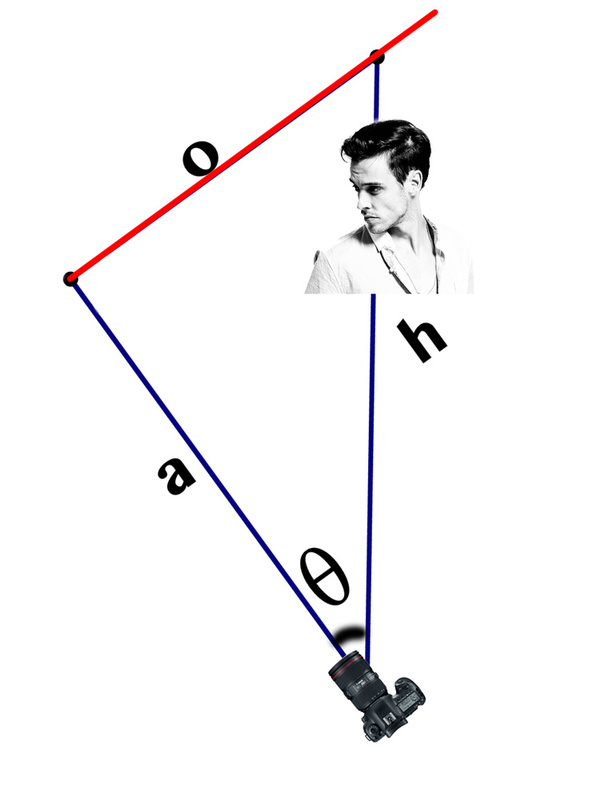 Then, I have three sides, the hypotenuse, the side opposite theta, and the side adjacent to theta. Having fun yet? Me too. 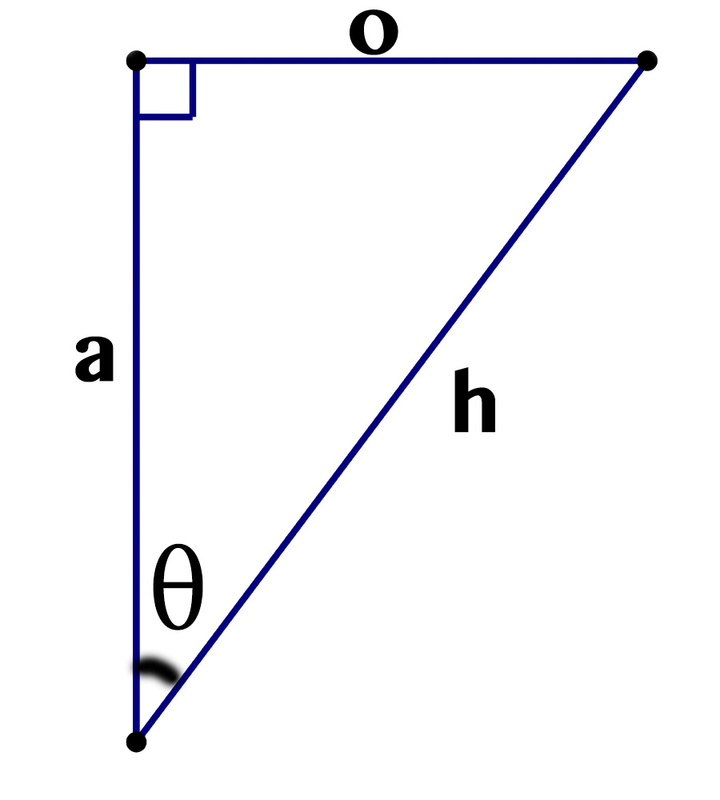 The trig function I'm interested in is cosine, which tells us the ratio of the length of the adjacent side to the hypoteneuse for a given angle θ. Why am I interested in that? Let me show you. Meet Ryan. He recently turned 30, loves his work as a writer and teacher, and though he wishes he weren't still single, he's holding out hope and has managed to avoid the existential crises that normally hit when changing decades. As part of his thirty, flirty, and thriving phase, Ryan is having his portrait taken for his new dating profile. To really make Ryan pop, his photographer is shooting him on an 85mm lens at f/1.8 from 5 feet away (this makes side "a" 5 feet long). This gives us a depth of field of 0.11 feet, or about 1.3 inches. Now, let's say Ryan's photographer uses the focus and recompose method, rotating the camera to the left after using the center point to get focus. Here's the key thing to note: the side o represents the plane of focus. Notice how it directly intersects his eyes. The plane of focus is in red. Now, the angle of view for an 85mm lens on a full-frame sensor is 24 degrees. So, rotating to the edge of the frame is a 12-degree shift. Let's assume the photographer rotated 10 degrees to frame Ryan near the edge of the frame. The angle has been exaggerated for the purposes of illustration. 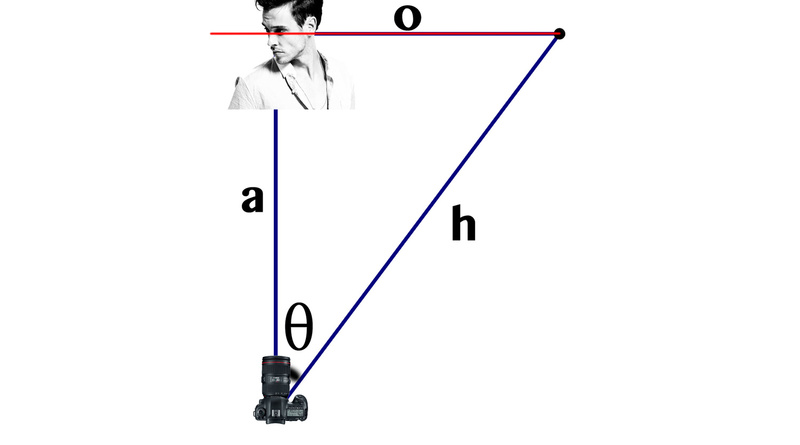 In other words, the focus point where Ryan is located has shifted 5.077-5= .077 feet or 0.92 inches behind him. Not a big deal, right? It wouldn't be, except the near DOF limit is this case is 0.63 inches in front of him, meaning the entire window of acceptable focus has shifted behind him, and his eyes are no longer within the DOF limits. Whoops. There are a number of ways around this, each with benefits and drawbacks. Benefit: This problem wouldn't exist. Drawback: They're likely not going to listen to us. Benefit: Your plane of focus will not shift. Drawback: You'll lose resolution. If you're shooting on a high-resolution camera such as the Nikon D810 or Canon 5DS, you probably won't care. Even on my 30-megapixel 5D Mark IV, it really doesn't bother me. Since your focal plane is shifting in a predictable manner, you can take advantage of your camera's AFMA adjustment to dial in a bit of front compensation, pulling the focal plane back toward the subject. However, I don't recommend this for the reasons below. Benefit: It will alleviate the issue. Drawback: This method should only be used if you constantly compose portraits the same way and focus and recompose at about the same angle. Otherwise, if you try to take a center-composed shot, for example, it will be front-focused. 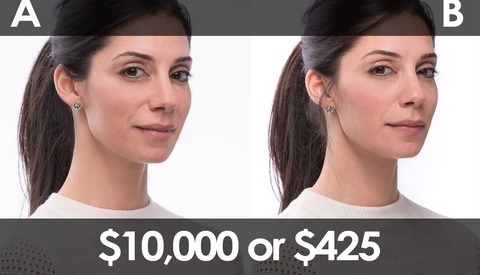 So, unless you make your living by taking the exact same portraits via the exact same method all the time, skip this. Benefit: You'll be using the AF points of your camera as intended and can expect a higher keeper rate. Drawback: It limits you compositionally. I like centered portraits. Call me crazy. Benefit: By increasing the depth of field, you can keep the shift within acceptable limits. Drawback: If you're someone who likes melty wide-aperture portraits, this kills that. Also, you're not solving the problem; you're just reducing its severity. Benefit: You'll get a wide focus range across the frame. Drawback: It can be difficult to shoot in live view, battery life suffers, contrast-detect AF is typically slower, and it may be tricky to precisely select focus on a smaller feature such as the eyes. So, since we're talking about corrective distances on the order of a few inches, you could conceivably focus and recompose, then lean back ever so slightly to pull the plane of focus back where it belongs. Benefit: It allows you to compose as you please, but still keeps the image sharp. Drawback: You're estimating distances. 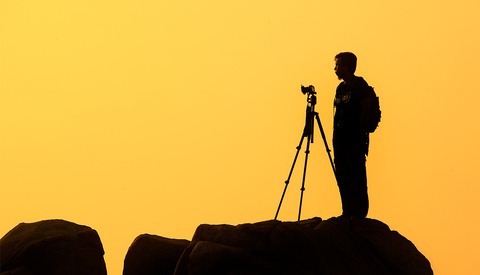 If you typically shoot with the same lens at about the same distance, you can probably develop decent instinct and muscle memory for how much to lean back. I've tried this, and while it's not perfect, I do notice an increase in my keeper rate. Shoot with the AF point nearest your subject in the desired composition, then focus and recompose. Benefit: You get your desired composition and reduce the error. Drawback: You don't completely eliminate the error, and depending on the spread of AF points on your particular camera, the correction may not be significant. Focusing and recomposing is an imperfect solution to a peculiar problem. It's important to be aware of the consequences of it, however, particularly if you often notice your portraits being slightly out of focus. I typically use the solution of leaning back or simply cropping in; both work sufficiently well for my shooting. Use whatever works best for your purposes and style. Leica/Rangefinder users have been dealing with this forever and "lean back" is just what you've got to do. Unfortunately it's a bit unreliable, even as you become more experienced, and especially with super fast f/0.95 to f/1.4 lenses. The newest ones with focus peaking really change the game. I also believe I read somewhere that Canon actually told 5D Mk II users to focus/recompose with the middle point because the AF was so lacking as a whole. I had to laugh. This has been a problem for ages, and interesting how many people have not noticed it and notice their images are not as sharp as they can be. The only camera system I know that tries to correct for it is Hasselblad's True Focus and True Focus II system used on their cameras since the H4D. While it is not perfect and still requires some technique to perfect usage, it basically uses motion sensors in the camera to analyze and correct for the horizontal and vertical shift from recomposing the image (and True Focus II now even compensates for the curvature of the lens). It would be nice if this was more exploited by other manufacturers, but until then, choosing the focus point you use with care, repositioning yourself for framing (when possible) to avoid recomposing, or "lean back" would be go-to short-term solutions we can use for crisp images, especially at shallow apertures and when close to your subject. There is a sense in which it's even worse than this. Traditional DOF calculations (the basis of http://www.dofmaster.com/dofjs.html) for the near and far limits are based on circle of confusions sizes for a image format in relation to an 8x10 print enlargement. But if you're simply looking at an image on your screen (say 27" 2560x1440) at 100% magnification on a 36MP FF sensor, then you're talking about the equivalent of a ~55" x 36" print. At that size, your near and far limits give you just fractions of an inch. Of course, if you then make that 8x10 print you're back to the traditional calculations and the numbers are right again. It's even larger than that. A 27" 2560x1440 monitor would have a pixel pitch in the neighborhood of 110 ppi. A 7360x4912 pixel (36.3MP Nikon D800) image viewed at 100% would be the equivalent of a 67x45 print. But then most of us would view a 27" monitor at a distance greater than the 10"/25cm viewing distance upon which the 8x10 DoF chart is based. Ah, you're right. When I was punching the numbers into https://www.sven.de/dpi/ I never changed it from 22" to 27". 22" is 133ppi = 55"x36" print. This is completely new information to me. I was using the focus and recompose method a lot and becoming more and more frustrated with the sharpness of the subjects. Now I understand why. Thanks for sharing. Dumb question (hey, I'm a photographer, not a mathematician! ): Instead of panning the camera left or right, couldn't the photographer simply track left or right by taking a step in the desired direction (or even better, using a tracking mount on a tripod) to maintain the same focus plane while repositioning the subject within the frame? Again, it would be imperfect, but it seems more precise than leaning back, no? Technically, you could absolutely do this. The two problems I see are the extra time involved to move, and the variance of distance that gets introduced as you move over. You might as well just lean back after recomposing. Not a dumb question at all! Mathematically, that's a perfect solution. The problem is that the distance required to move the subject across the frame via horizontal translation is much bigger than that needed when leaning back, and I suspect one has much more precision control of their body when keeping their feet planted and simply shifting their upper body slightly. I thought this was common knowledge as its very basic math/physics. Your solutions are however pretty good to work around it. 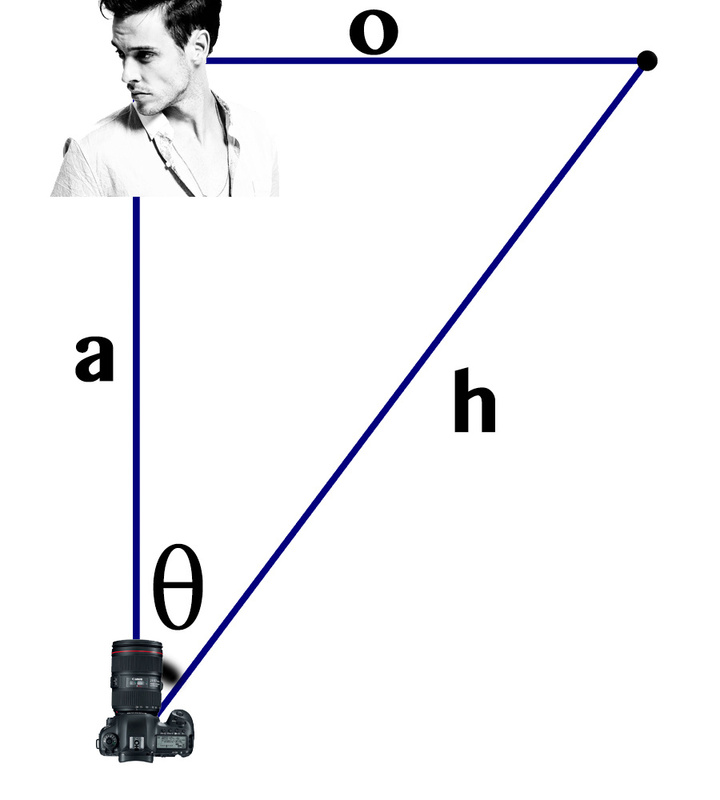 Personally I would probably use the a point as close as possible and then just very slightly recompose. Also worth mentioning, there is a lot easier to calculate the difference in distance by just using A^2+B^2=C^2. Didn't really see the point of complicating it with trigogeometry. It's common knowledge to experienced photographers, yes. There are a lot of people who are relatively new to the craft. There are also a lot of people who are good creatively, but not technically-minded. I used trigonometry for two reasons. First, it directly connects the angle of rotation to the difference, which I think better represents the physical act. Second, the length of side o is not explicit, as the initial presentation is an angle-side-angle (ASA) problem, so we need some trig anyway. What you can say heuristically is that the hypotenuse is always longer than the two other sides, so we know automatically that the plane of focus will shift backward, but the trig gives us exact results. At apertures F/2.8 and smaller, depth of field will suffice, as it did in the decades before when the only focusing aid was in the center. 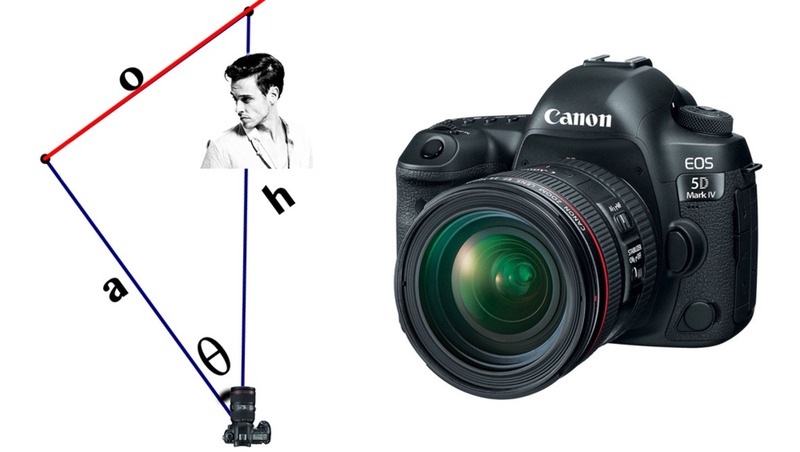 The reason (at least as given by Canon's Chuck Westfall) that focus points are not spread farther around the 24x36mm format is because the focusing system becomes increasingly inaccurate as the light ray angle moves away from perpendicular. If you measure it out, the actual physical spread is the same for APS-C and 24x36mm...but it covers more of the area of the smaller format. Of course, on-sensor focusing doesn't face that limitation. Lean back is a very useful technique. Stop down too. I shoot a lot with old manual focus film cameras or old autofocus film cameras with single point or very limited multi-point spreads and have adapted my technique consequently. Live view or immediate chimping not being an option, you tend to get better at distance judgement by eye alone. I have never been a fan of autofocus, the focus point is rarely convenient and shooting nearly wide open allows very little margin for error. I tried back in the Nikon F4 and 5 era but chose to focus manually. Now that I use Canon, I love my L lenses and still use MF. Imagine explaining the law of physics to your client and being too lazy to take control of the shoot. Another option... upgrade your d*** camera! That's what I did! lol I went from the 6D to the 5D Mark III solely for the spread of the AF points. I later moved to the 5D Mark IV and enjoy the even further spread (although minimally so) AF points. Here is my two cents worth.......because of the curvature of the lens, many moons ago doing group shots, we would run a string from the tripod to the group and arrange the subjects along the arch the string would make. Perfect focus except for lens distortion. If you want to add another piece of equipment to your load, purchase a panoramic head and find you nodal point for the lens of choice. Problem solved. Ya a bit cumbersome but it works like a charm! P.S. Tell your subject not to move a muscle! Hmm, I remember something like this as well for shooting flat lay posters (curving them to match the curved focal plane). If the focal plane was curved as you're suggesting then the entire premise of this article would be incorrect and there wouldn't be any problem with recomposing as your focal shift would be along a curved line. Alex do you wanna weigh in here with science? You're describing field curvature, which is undesirable in a lens and is mostly designed out of it these days (Zeiss Planar is a great example). Uncorrected field curvature is why lenses such as the EF 85mm f/1.2 are so popular for portraiture. They don't do well shooting flat test charts because they weren't designed to shoot flat test charts. They're misunderstood to be *soft* on the edges when in reality they can be very sharp on and near the edges if that is where the lens is focused when aimed at a flat test chart. The current obsession with corner to corner flat field sharpness is great if you are a landscape photographer or do document reproduction, but actually exacerbates the problem of focus and recompose in portraiture. There are other advantages to a lens with field curvature for portraiture. Just look at an example shot with a flat field lens that is razor sharp at wide aperture of the classic "shoulder forward" pose when the subject is wearing a textured fabric and the spot on the leading shoulder that is the same distance from the camera as the subject's eyes sticks out like a sore thumb. Even the most well-corrected lenses have a field of focus that is shaped more like a lasagna noodle than a perfectly flat plane. So the trig is still as much an art as it is a science. Or you could shoot large format, use a loupe, and tell your model if they move, they die. Maybe that's just a good one for me, though. Great article, Alex. I knew I'd use trig someday! I should! I havena friend who does tin types. Ill borrow his. Solution: Learn to manual focus. Modern DSLRs are not designed for manual focusing, and it can be very difficult to do at wide apertures through the viewfinder. Agreed. I have the Canon 5D III and it doesn't have interchangeable focusing screens. I own two film cameras, Canon A-1 and New F-1; both have interchangeable focusing screens. I've been using the split-image microprism since 1980 and that is one thing lacking on my 5D. On occasion, I have had to switch from auto focus to manual focus, either due to low light or because the subject of interest was in the background instead of the foreground. I exclusively shoot in isosceles triangles. Problem solved. Very well written article, Alex! I use the focus and recompose method a lot and am able to get tack sharp shots shooting at wider apertures. However, for every sharp shot I get, I can count on getting one that's not sharp almost exclusively because I use this method. Even though trig would not be my strong suite (that's a huge understatement), your article made perfect sense. I also loved how you presented multiple solutions as well as the pros and cons to each one. Very informative and well thought out.